It’s super easy to get started with Rainbow Repeater. At the bottom of the game screen, you’ll see a big button that says “Stake”. Give the “Down” and “Up” buttons on the side to it a few taps or clicks to adjust it to the size you want. You’re betting on all 5 paylines so really, after setting your bet size, you’re ready to give that Spin button a big push! Once you’re comfy with everything, you can also try the Auto Play feature and let those reels spin by themselves as you watch the colours roll by! Additionally, there’s a Wild symbol that not only substitutes other symbols to form a winning payline, but it also acts as a Scatter that triggers the Rainbow Repeater feature. More about that in the Special Features section. In the base game, the fixed jackpot in Rainbow Repeater is when you spin 3 violets, which will get you 10x your bet. So if you’re playing on a £1 stake, that’s £10 profit. Now this is a rather modest when it comes to online slots nowadays, but Rainbow Repeater comes with frequent wins, so it does add up. 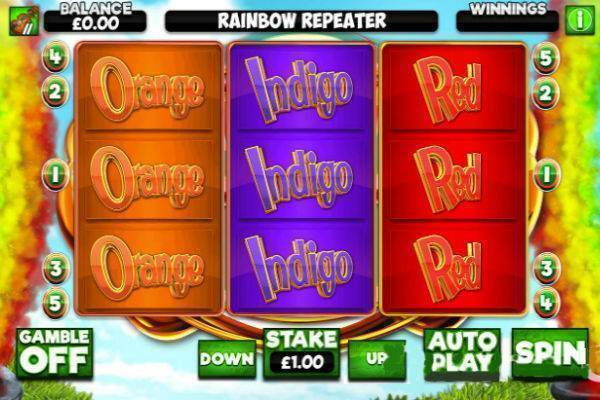 Plus the really big prizes are to be won through the Rainbow Repeater bonus game! Rainbow Repeater Bonus: If you have a winning payline that includes a Wild symbol (which only appears on Reel 3), then you will trigger this special feature. When this feature is active, the repeater’s arrow will be spinning. Stop the arrow at anytime by pressing on the screen. If the arrow lands on a repeat section, then your initial win will be repeated and added to the featured total. This keeps on repeating until the arrow lands on the bank section or when maximum win is reached! Gamble Feature: You might have noticed that there’s a Gamble button to the left of the game screen. At any time, you can decide to turn it on. When the Gamble feature is activated, every win will give you the additional option to make it bigger! Rainbow Repeater is loud and colourful. The game background has two clouds of rainbow in the sky, and the buttons and symbols are all bright and bouncy. The reels spin smoothly and overall this game proves once again sometimes well-executed simplicity is all that you need. With just 3 reels, Rainbow Repeater sports the simple format of a classic slot, but has spiced up the game play with a bonus feature where you can collect tons of cash prizes. This slot is colourful, bright, loud and proud. Check in for some easy twirls on Rainbow Repeater at one of the recommended slot sites!